Copyright © 2003-2015 Pacific Wushu. All rights reserved. 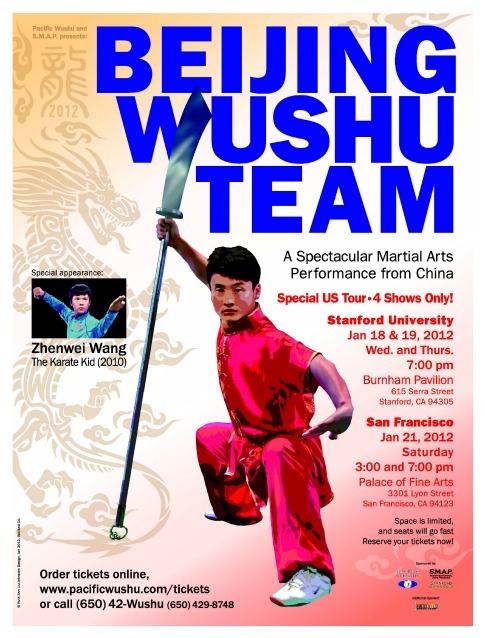 The world renowned Beijing Wushu Team is touring the San Francisco Bay Area in January. Considered one of the best wushu (moderinzed Chinese martial arts) teams in the world, the team's history is legendary. It has consistently dominated national and world championship events. From 1975 to 1985, the team achieved a feat that no team has ever accomplished, before or since – winning the national championship for ten consecutive years. As wushu competition has increased over the years, the team has remained a powerhouse in martial arts: the current touring team includes World Champion, Li Xin Yu and National Champion, Wang Xi. The team has also produced a number of famous action movie stars. One of the team's earliest and most famous members is Jet Li, who trained on the team from an early age. Zhenwei Wang, who played Cheng in The Karate Kid (2010), is also a current member of the team, and will be performing on the tour. 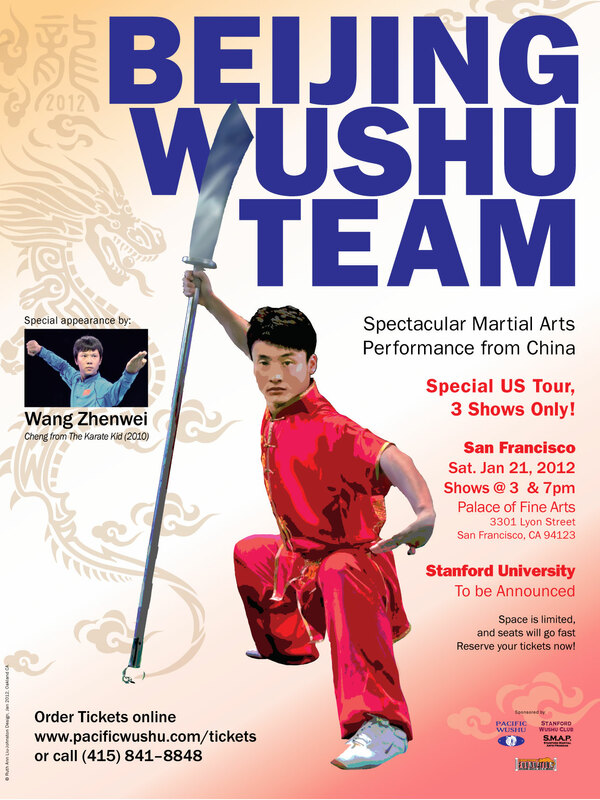 Along with performances at Stanford University, the Beijing Wushu Team will also have two performances at the Palace of Fine Arts Theatre in San Francisco on January 21, 2012. Constructed for the 1915 Panama-Pacific Exposition, this monumental location hosts spectacular events from around the world. Please check the Palace of Fine Arts Theatre for directions and parking information. Instructors Phillip Wong and Zhang Hong Mei and students will perform at the Asian Art Museum as part of the museum's ongoing Matcha events calendar. Don't miss this special one time performance. More information at Asian Art Museum. The video clip from an episode of the KTSF Chinese program 《生意・人》 shows the host 江濤 interviewed Instructor Zhang Hong Mei at Pacific Wushu Berkeley about her background, accomplishments and teaching philosophy. 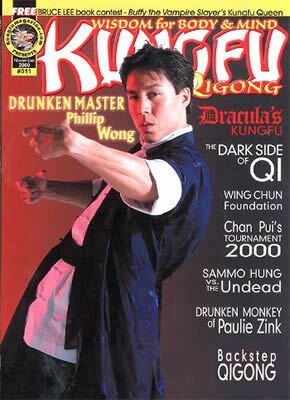 In this cover story of the November 2000 edition of Kung Fu Magazine, Instructor Phillip Wong discussed the origins, techniques and movements of his famous drunken style.